HINCHINBROOK (AUS) (Bay 2007-Stud 2011). 2 wins at 2, AJC Skyline S., Gr.3. Leading Aust. First Season Sire 2014-15. Sire of 311 rnrs, 203 wnrs, 16 SW, inc. Press Statement (BRC JJ Atkins S., Gr.1), Seabrook, Beat the Clock, Whispering Brook, Derryn, Leonardo da Hinchi, Diamond Tathagata, Salsonic, Samara Dancer, Spright, Flippant, Flying Jess, Unite and Conquer, Improvise, Manaya, The Virginian, SP Problem Solver, etc. Brook Magic (f. by Hinchinbrook). 4 wins. See below. Pure Exceleration (g. by Excelebration). Winner at 1400m in 2018-19 in Aust. Magita. 4 wins. See above. Mundo Nova. 3 wins to 1200m in Aust. Good Luck Charlie. 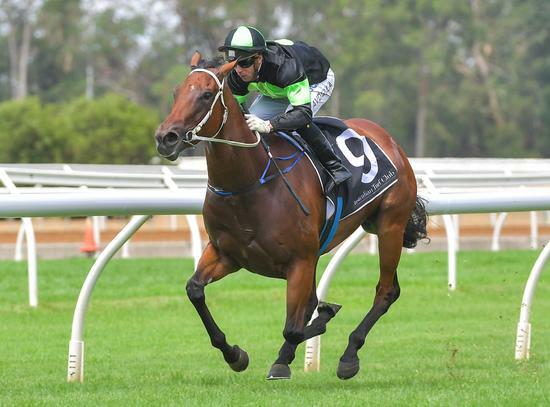 2 wins at 1050m, 1150m in Aust. Not a Bad Joker. Winner at 2 in Aust. Albykita Magic. Winner at 2 in Aust. Sequoia Rose. Placed in Aust. Perfect Sport. 9 wins at 1000m, 1200m, HK$3,169,415, HKJC Sim Sha Tsui H., Pak Tin H., On Ting H., Mai Po H., Yokohama H., Ping Shan H., Skipness H., Zhuhai H., 2d HKJC Tea for You II H., 3d HKJC Orchid H.-twice, Xinjiang H.
CATACAOS - GHOZI (Sing.) (Catbird). 7 wins to 1400m, A$56,000, S$845,005, Singapore TC Stewards' Cup, L, Kranji Sprint, L, Open H., AJC Stroud Park H., Singapore TC Kranji C S., Class 3 H., 2d Singapore TC Committee's Prize, L, Kranji A S.-twice, Open H.-twice, Happiness S., STC Ian McCall 70th Birthday H., Singapore TC Kranji C S., Class 3 H., 3d Singapore TC Kranji Mile, L, Patron's Bowl, L, Lion City Cup, L, Jumbo Jet Trophy, L, Kranji A S., Hawkesbury RC Concole Concrete Sweepstakes H., 4th Singapore TC Krisflyer International Sprint, Gr.1, Garden City Trophy, L.
Spur Me On. 7 wins-1 at 2-to 1350m, A$252,975, STC Young Members Cruise 2YO H., BTC Women in Finance Welter H., GCTC Waterford Crystal Magic Millions P., BTC Foster's H., QTC XXXX Gold P., 2d STC Diskovolos H., NSW Tatt's RC Eastlakes 2YO H., QTC Readikits P., Functions & Catering H., Miriam Gittins H., BTC Rovral GT H., 3d STC Barry Hall & Jason Saddington 2YO H., AJC San Miguel H., BTC Call 13 62 55 H., 4th STC Pago Pago S., Gr.2, GCTC Magic Millions 3YO Trophy, RL. SHAMUS AWARD (Snitzel). Champion 3YO Colt in Australia in 2013-14. 2 wins at 1600m, 2050m, A$2,473,500, MVRC WS Cox P., Gr.1, VRC Australian Guineas, Gr.1, 2d VRC Sires' Produce S., Gr.2, MVRC Bill Stutt S., Gr.2, Mitchell McKenzie S., L, 3d MRC Caulfield Guineas, Gr.1, CF Orr S., Gr.1, VRC Maribyrnong P., Gr.3, MVRC Inglis Banner 2YO S., RL, MRC Chairman's S., L. Sire. Allstars Express. 2 wins at 1¼m, Lingfield Union Transport Group Shipping H.
MIDNIGHTLOWDOWN (Stormin' Lyon). 8 wins to 6f, US$226,221, Zia Park New Mexico Classic Cup Championship S. (c&g), L, Albuquerque Casey Darnell Pony Express S., L.
4 wins-2 at 2-at 1000m, 1100m, A$237,085, to 2017-18, ATC Theraces H.-twice, 2d ATC TAB Rewards 2YO H., Forum H., Hyland Race Colours 2YO P., 3d ATC Book Spring Now Sprint H.